It’s probably fair to state that a majority of breweries operating today are employing single-infusion mashes – that is, they target a single temperature and try to maintain it throughout the entire mash. Broadly speaking, that temperature would almost always be in the range 63-72°C (145-162°F). When a highly fermentable wort is desired, it may be necessary to employ a “step mash”, utilizing multiple temperature rests. I don’t want to go into too much detail, but the basic mechanism employed is that the β-amylase enzyme acts first to cleave amylopectin (starch) molecules into maltose (sugar) molecules, and then α-amylase reduces the remaining dextrins (unfermentable sugars), producing the fermentable sugars maltose and glucose. Since the temperature optima for the two enzymes are different, the mash must be heated from the lower-temperature (β-amylase) rest to the higher-temperature (α-amylase) rest. This can be done either by heating the mash directly, by an additional hot liquor infusion, or by decocting a portion of the grist. The bottom line is that, compared to a single-infusion mash, a step mash requires either additional equipment, additional effort, or both. From a purely practical perspective, it would be preferable to reverse the mash steps and simply allow the mash to cool itself. In order for this to result in a highly fermentable wort, however, the temperature would have to remain in the α-amylase range for a short enough period of time that there is still β-amylase available once the temperature drops. A casual (read: online) survey didn’t turn up any primary sources for the half-life of β-amylase at mash temperatures, so I decided to test the concept myself. Two small test mashes were conducted: one a conventional step mash with β- and α-amylase rests, and the other a “reverse mash” which began in the α-amylase range and was allowed to drop in temperature over the course of the mash. The grists were composed of 500.0 g of Cargill Special Pale malt, and 2.00 kg of strike water, for a mash ratio of 4.00 L/kg (1.92 qt/lb). In order to ensure that the mashes were of equal length, the reverse mash was conducted first. I had planned on mashing for about an hour total, but the ambient temperature (7°C/44°F) meant that the reverse mash dropped below 60°C after only 35 minutes. The control therefore used two 15 min rests, allowing 5 min for heating. 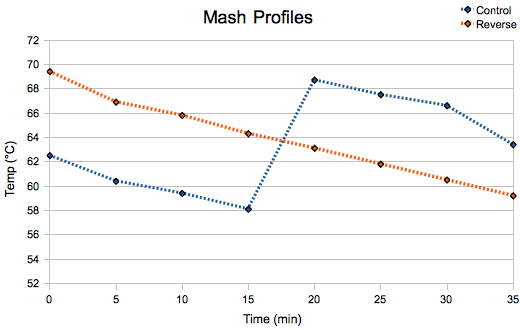 The resulting mash temperatures profiles are shown to the right. After each mash, the grain bag was removed to a second pot containing 1.50 L of water at 85°C (185°F) and agitated continuously for 5 minutes for a combination sparge/mashout. The grain bags were then placed over the pot in a colander and allowed to drain for an additional 5 minutes. In order to eliminate mechanical extraction as a variable, the bags were not moved or touched during this time. The worts were then boiled for 15 min, primarily as a pasteurization mechanism, then set outside to cool. Once they had chilled below 20°C/68°F, 2.0 L of each wort was decanted into a glass jug, on top of one level teaspoon (approx. 5 g) of dry bread yeast. Assuming a conservative value of 5 billion viable yeast cells per gram of dried yeast (the typical count for a dry brewers’ yeast is 20 billion/gram), this resulted in a pitching rate of at least 1.25 million/mL-°P. The fermenters were then placed side by side in my fermentation closet, with a space heater set for 15°C/59°F. Actual ambient temperatures ranged from 14-19°C (57-66°F). Since I only have one stir plate, the samples were rotated each morning and evening, so that each spent about half its time on the plate. My supposition is that by over-pitching and fermenting warm, the worts both fermented to terminal gravity, even given minor variations in the amount of time they were stirred. After 96 hours, the fermenters were removed and gravity readings taken. Original gravities for the two samples were 9.7°P for the control and 9.1°P for the reverse mash, corresponding to overall efficiencies of 74% and 69% respectively. On a commercial scale, the increased extraction alone would justify the conventional step mash, although the variation is small enough that it probably wouldn’t be a concern for most home brewers. Final gravities were 1.006 (1.5°P) for the control and 1.007 (1.7°P) for the reverse-mashed sample. The corresponding attenuations are 69% and 67% respectively. While it’s dangerous to make conclusions based on a single trial, it appears that reverse mashing can result in a wort with roughly the same fermentability as a traditional step mash – at least when short rests are employed. More generally, these results suggest that denaturation of β-amylase is not complete after 15 minutes at temperatures favoring α-amylase. Further testing would be needed to establish what limits, if any, exist. I plan to conduct at least one more set of mashes, utilizing longer rests, once summer rolls around. This experiment has been extended in a new post. Been following your blog for awhile– love the brew science! Re: the latest experiment, I’d really like to see a third variable: single temperature infusion. Since that’s what most brewers use, that might give a clearer picture of the comparative advantages of a ‘step mash’ or a ‘reverse mash’, especially since the ‘reverse mash’ requires no additional equipment outlay. Thanks Matt. On a blonde I did recently with the same grist and similar mash ratio (4.8 L/kg), it fermented down to 60% RDF. That was a one hour mash at 69°C. I don’t know to what extent that’s helpful though, since in that case I was not mashing for fermentability. Would you be interested in seeing a comparison to a one hour rest at lower temperature? ~20% of the base malt (German Pilsner in this case) was held back to reintroduce amylase for the second step. As a homebrewer I’ve been perfectly content having no statistical data to back up the continued use of the method, but someone with more time and interest might find it an worthwhile experiment to play with.